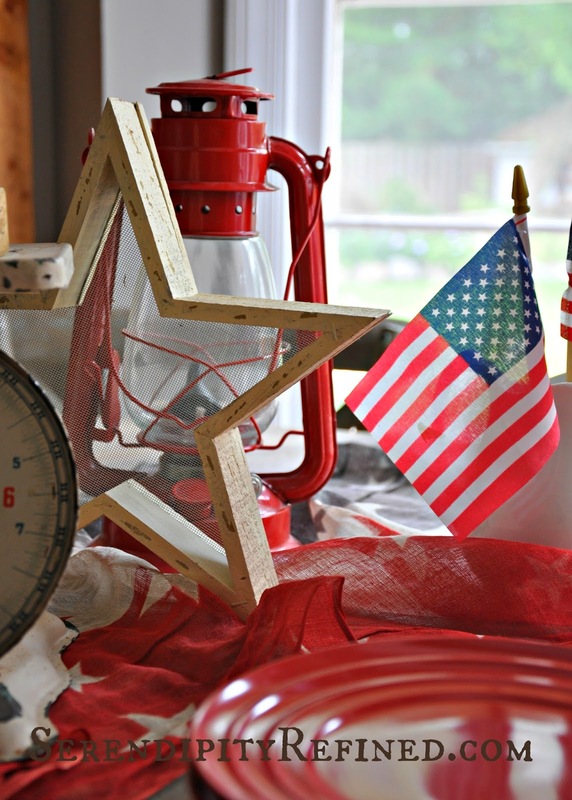 Today, I finally got a couple of bins of 4th of July decorations out of the attic and decided to put a few vintage red white and blue things on the kitchen table. I really didn't plan on doing too much decorating this year. Yeah, I know...my son....a minimalist...how in the world did that happen?! ....I don't like to rush into things. After the new hardwood floors were installed (read about them here) in the farmhouse dining room two weeks ago, the search was on for a new rug. 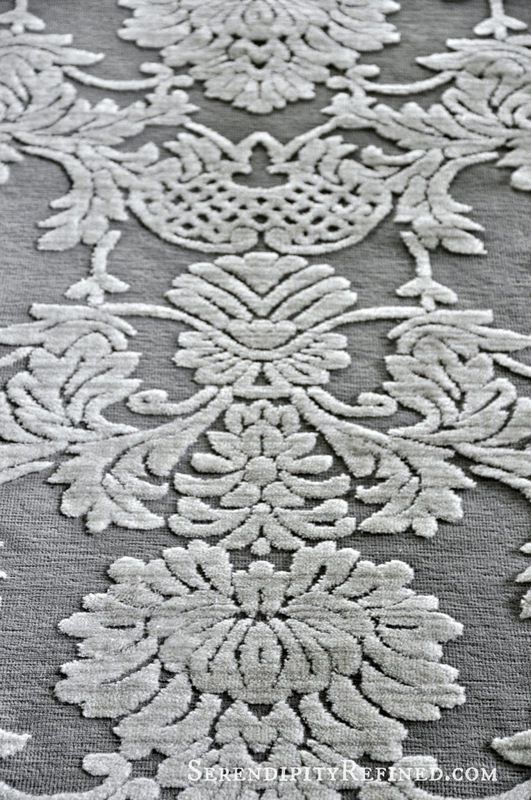 The dining room rug from our last home is my "new" bedroom rug so I was needed to find someting new. I made the decision not to have carpet in the farmhouse due to the fact that I have allergies and we have a dog. 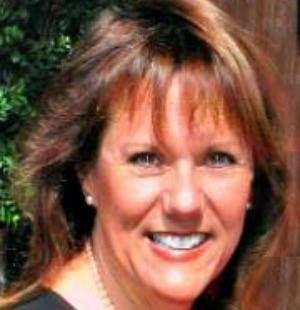 I decided that it's easier to maintain hardwood and area rugs (of course, I may change my mind at some point but for now, that's the decision....hardwood throughout the house with the exception of bathrooms, the laundry room, the mud room and the stable hall. Where was I? Oh yeah, the dining room rug. I knew that I wanted grey and ivory. I knew that I needed 8x11 feet. 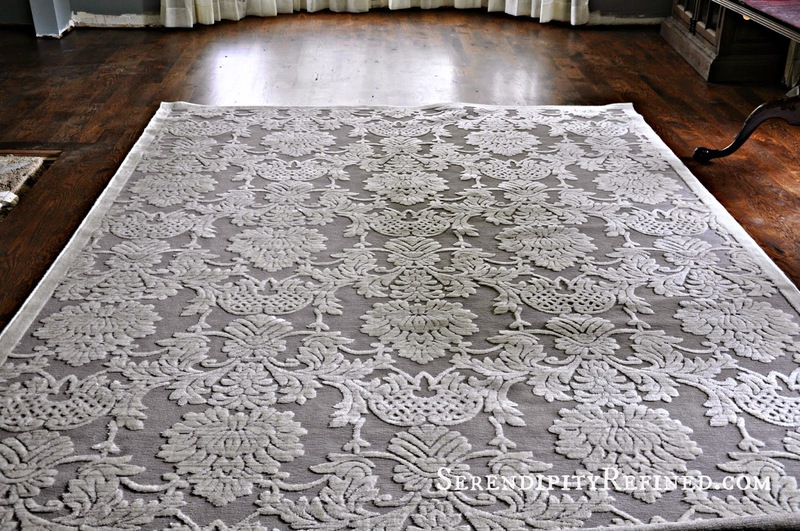 I also knew that I was not going to purchase an "heirloom quality" rug since we'll rarely be in this room and I want to "save" the money for other things....like plumbing. 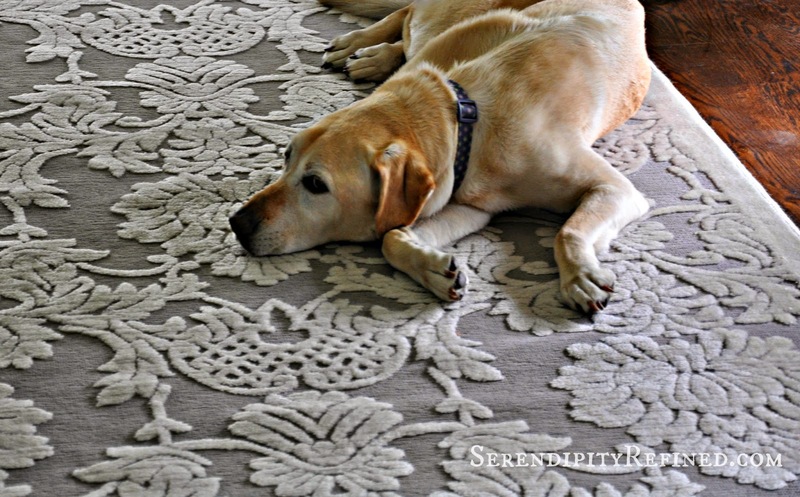 I placed the order on line and the rug was at my home and on the dining room floor with a big yellow lab on it,four days later! I'm happy to report that I was able to convince the dog to move long enough to put the dining room table and chairs on the rug as well! The dining room project is moving forward. 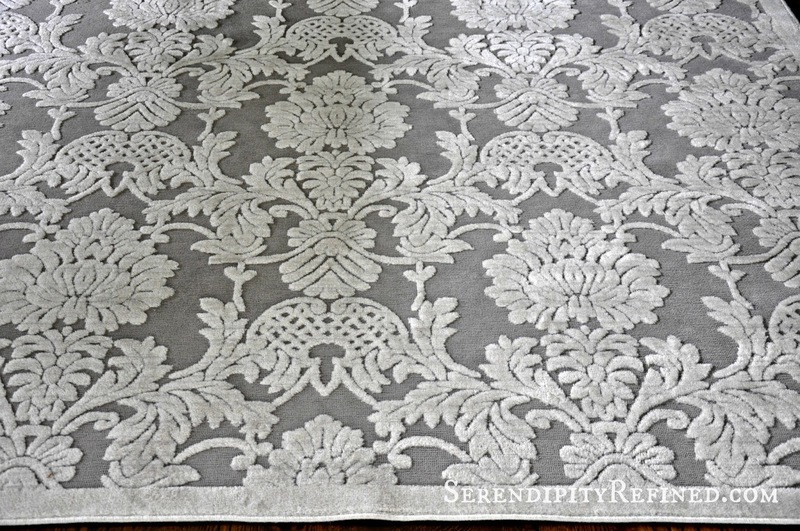 I still have lots to do but I found a rug that I love at a price that I could afford...and it's "Piper approved", too! Sheesh! I almost missed sharing this with you in time for Father's Day! I've been so busy rehabbing that I nearly missed showing you the quickest, easiest, most darling, one of a kind Father's Day gift idea ever.......in the history of ever! 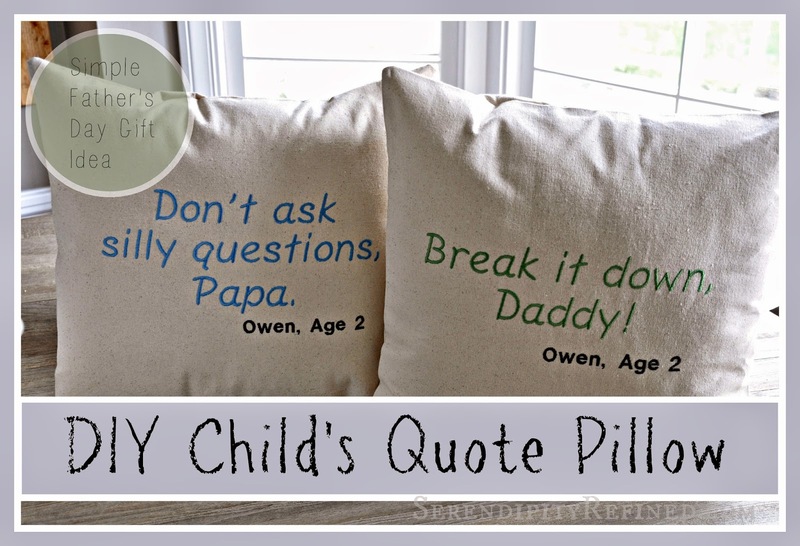 Father's day pillow covers with quotes from children to their Dad or Grandpa! 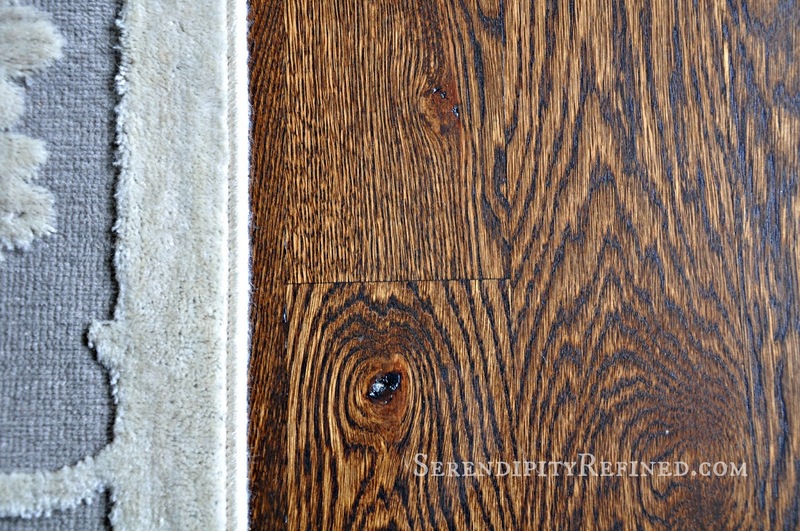 The new hardwood flooring was installed in the first room at the French farmhouse last week and I couldn't be happier! 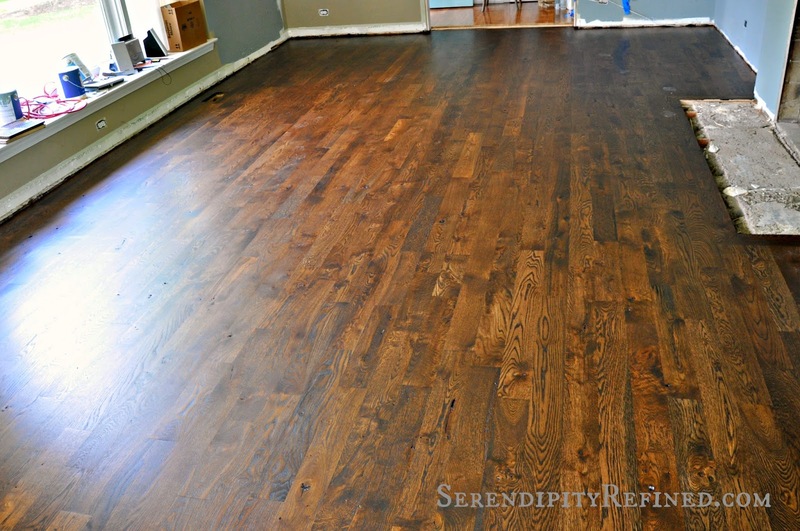 I chose 4 inch wide, rustic grade, white oak with dark stain and a waterborne finish. When faced with choosing the material that will cover 80% of the floors in my home, I wanted to be sure that I loved it, that it would fit the style and feel of our home, and that it would hold up in high traffic areas like the kitchen a and family room. 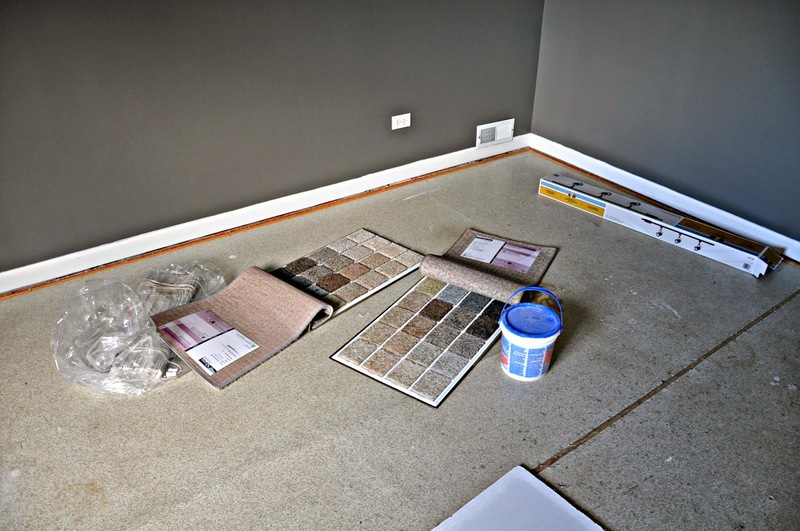 Before going through the trouble and expense of installing any new floor, it's important to know that the underlayment (base over which the new floor will be installed) is sound so that the new floor will be level and won't squeak. The prior owners had taken what I call the "lazy man's approach" to flooring. 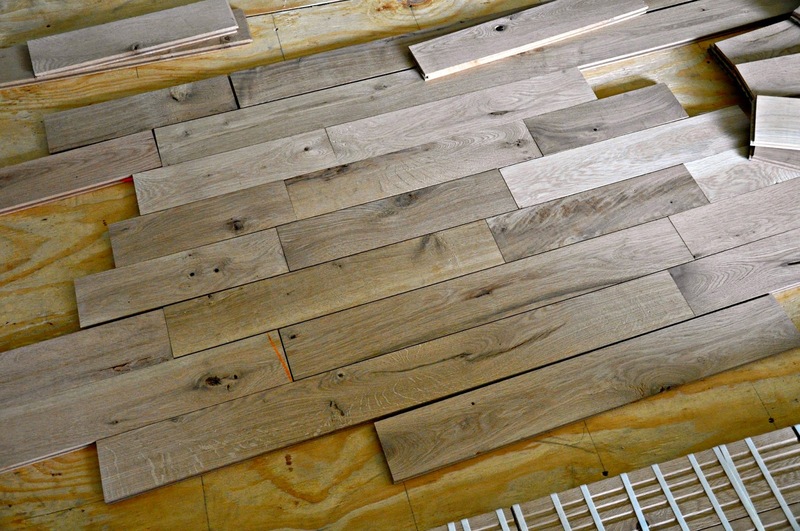 They simply glued and nailed layers upon layers of flooring, one on top of the other. 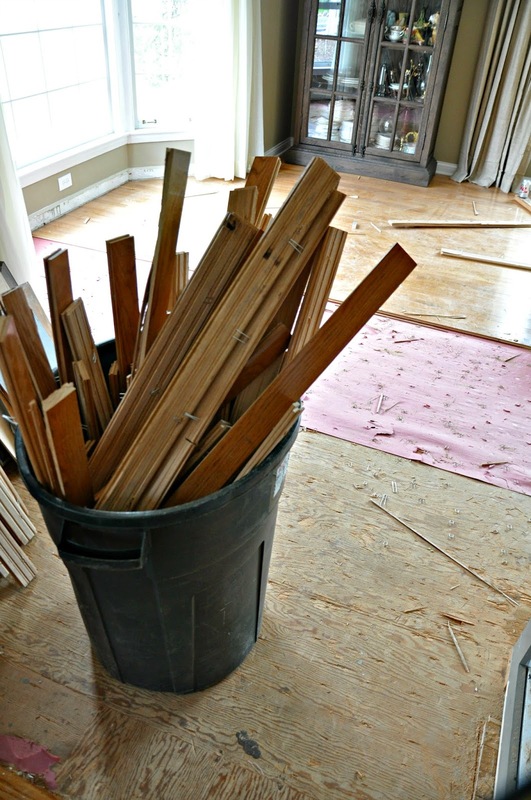 Once the old flooring was removed and disposed of, the flooring installers took over. I've found that on a rehab of this scope, knowing when to call in the pros is a good thing. It actually saves money when I let a pro handle the parts of the renovation that I'm not good at. A new layer of 3/4 inch plywood was glued and screwed to the original 1x8 subfloor. 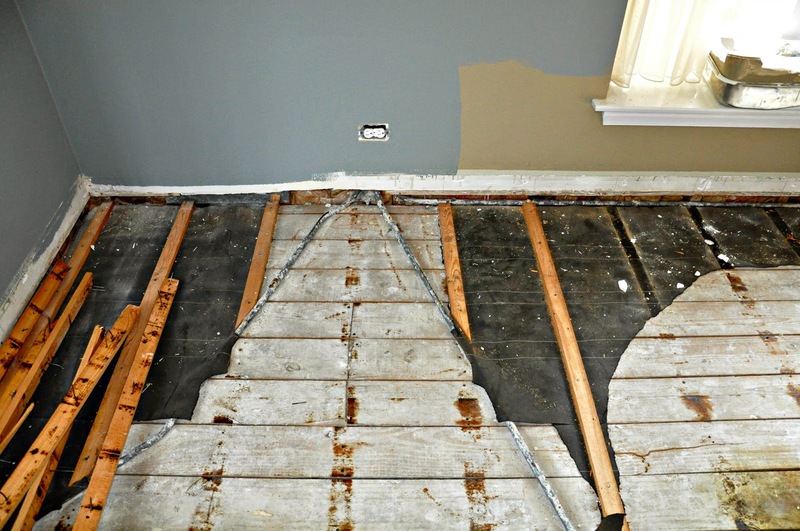 This was done to stabilize the floor and to allow for the electrical conduit which runs on top of the floor joists in many homes which were constructed prior to 1955. Then it was on to the flooring! I chose white oak because it's the most cost effective of the hardwoods that are readily available in my area.While I love bamboo, walnut and hickory, the cost for them was two to three times that of white oak. Oak was also in keeping with the vintage farmhouse feel that I'm trying to achieve and 4 inch wide planks are perfect for the scale of my home. 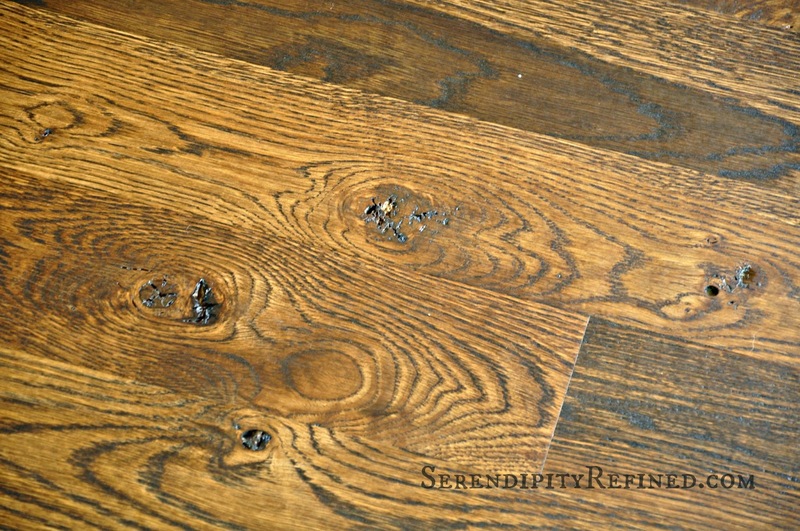 Wood flooring comes in several "grades"which have an effect on the characteristics and cost. This grading system applies to all species of wood. The names may vary slightly based upon your supplier so always make sure that you know what you're getting before you order. "Premium" (also known as "clear" or "select"). This is the "best" grade. 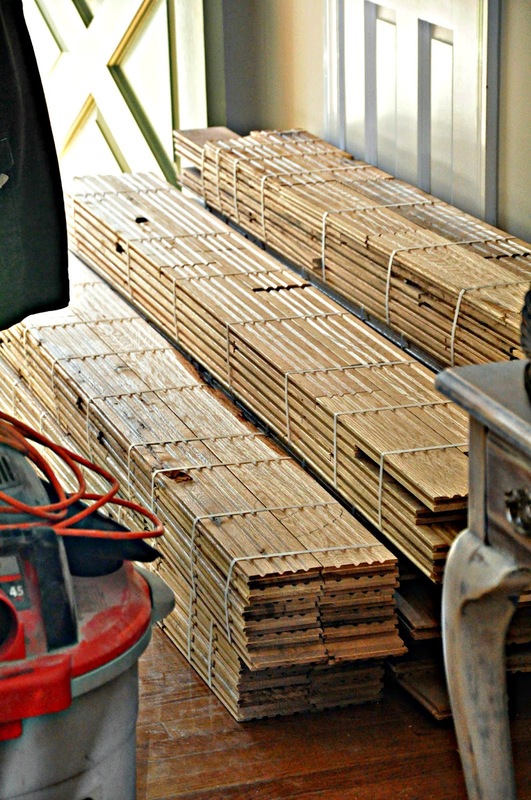 The planks come in longer lengths and contain some of the characteristics of the wood like minor variations in color and small knots. "Natural" (also known as "Grade 1" or "common"). The wood has color variations but has a slightly shorter average plank length than premium. It's normal for these boards to have some very limited minor blemishes. "Rustic"(also known as "Grade 2" or "cabin grade"). 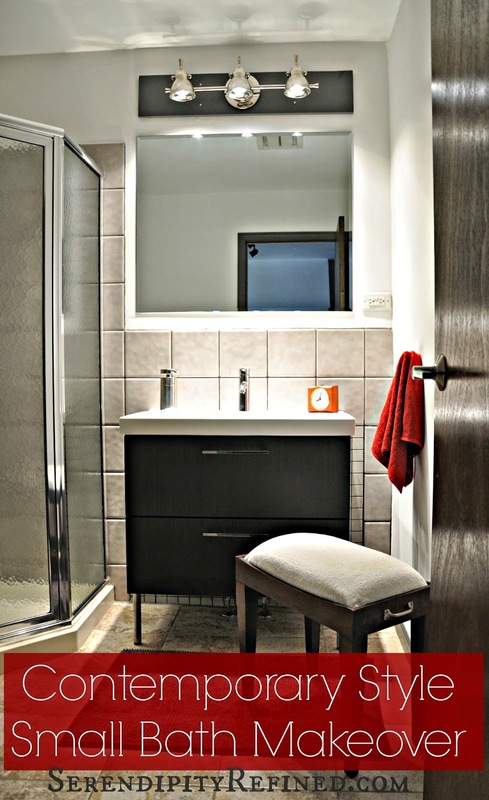 This type of wood contains the full range of coloration, mineral streaks, worm holes, knots, checks and other imperfections other than those that would impair the serviceability of the floor. The boards are shorter than either of the two "better" grades. "Utility" (also known as "Tavern grade"). This is the least expensive grade. It contains mis-manufactured boards, split and rotten ends and a host of other defects that in some cases, result in the wood not being usable. The average is 20% to 25% waste using this grade and there are usually no returns allowed once you purchase it. 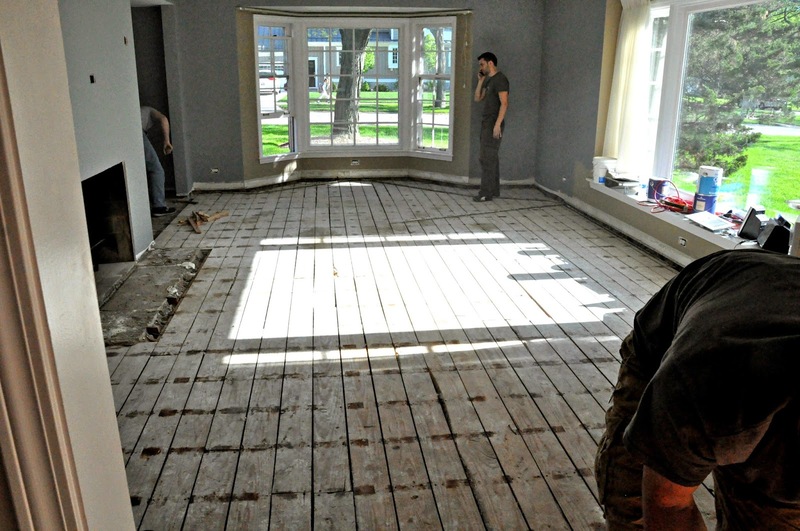 "Reclaimed flooring". This is flooring which has been previously installed at another location. I would have loved to use reclaimed oak but found that it was the most expensive oak option which meant that again, for me, it really wasn't an option. The hardwood was glued and stapled to the plywood using 2 inch staples and construction adhesive. Once it is in place, it is sanded and buffed. At this point, the finish is applied. I chose Antique Brown stain. Above is a photo showing the "turn board" at the opening to the dining room. A turn board is used to lock the flooring in the dining room into position because we're not ready to do the floors in the other rooms of the house. 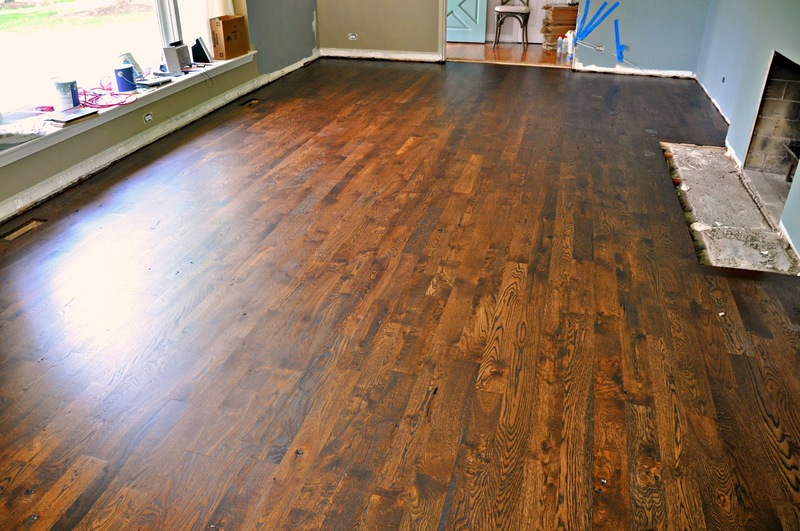 Note: In an effort to keep this project as eco-friendly as possible, I looked into alternative methods of staining and finishing our floors including using milk paint as a floor stain and hemp oil or wax as a finish. I chose not to use them for the following reasons: 1) I discovered that the finish is not as durable as I need it to be. 2) A "brown painted" finish is not as clear as stain and would not allow the character of the wood to show through as well as traditional stain does. 3) The floors in my high traffic areas would need to be recoated far more often than I'm willing to deal with..4) Hemp oil takes 24-48 hours between coats and up to twenty eight days to fully cure. (My green certified water borne finish is dry in under 4 hours and cured in 24 hours.) 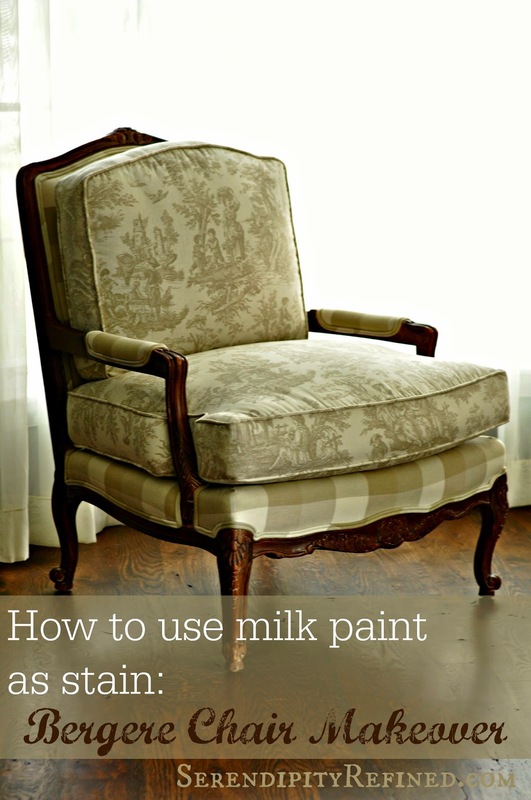 I gathered this information from the MMS website as well as Homestead House and Apartment Therapy's answer forum. My floors are finished using the Bona finishing system. (I was not compensated in any way for this post. I'm sharing this information because I happen to love this product) It is a Swedish, waterborne cross linking polymer that is greenguard certified for indoor air quality that is safe for children and pets. They continue to work toward sustainability and greener solutions which I look for when choosing products that I use in my home. I used this finish in our last home 12 years ago and I still love it today! 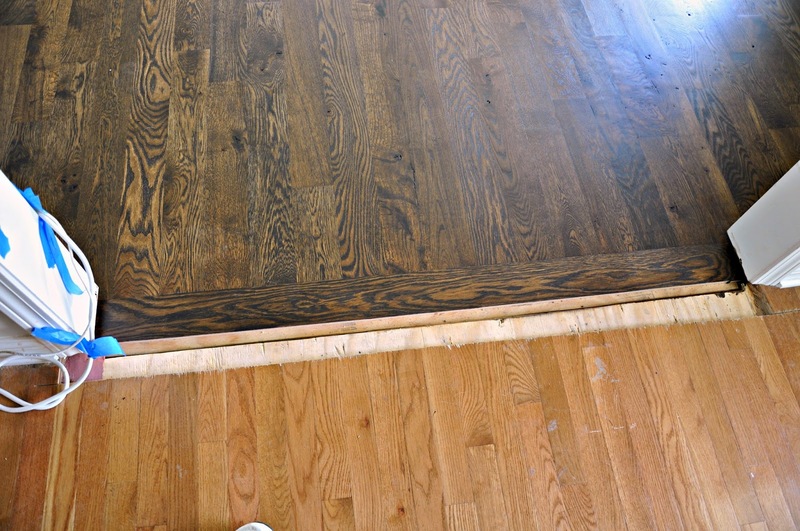 The floor is damp mopped (to open the grain so that it will better accept the stain) and then the stain is applied. It dries in only a couple of hours and the sealer is applied. After the sealer, the floor is buffed, vacuumed and the first coat of Bona "Traffic" is applied. 12-24 hours later, the floor is buffed and vacuumed again and the final coat of Traffic is applied. It's dry and ready for furniture in just a couple of hours but I decided to allow it to harden for 24 hours before we moved in the large pieces. 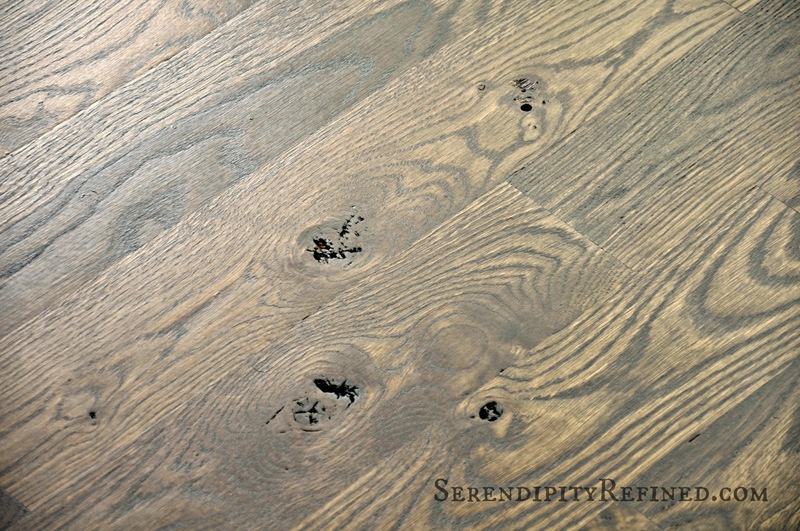 I can't wait until I have these wide plank oak floors installed in the rest of my home! I love the way the dining room is coming together....of course, I also love being able to watch television in the TV room without having to look past the dining room table! 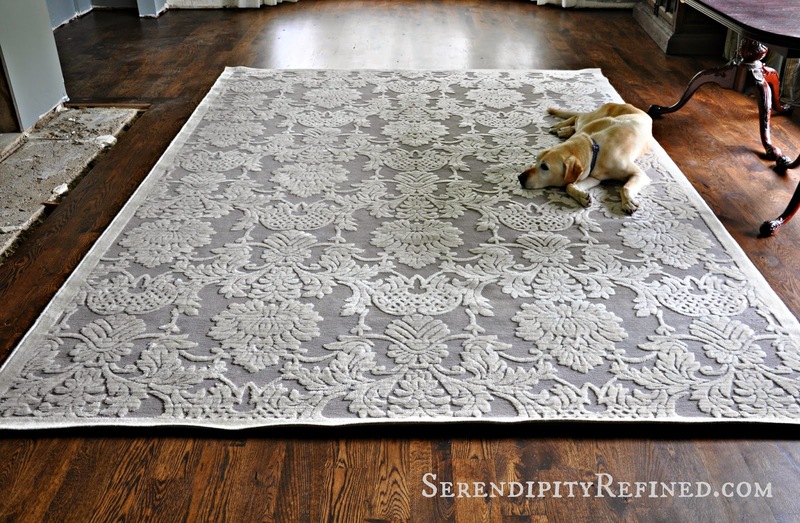 You may have noticed a little peek at the new rug that arrived yesterday in the photo above...if you'd like to know more about it, visit my dining room rug post (here)! My son and I got to spend some time working on his apartment this weekend (when I wasn't home watching the guys who are jack hammering out the patio at the farmhouse. I'll have a post on that, soon). 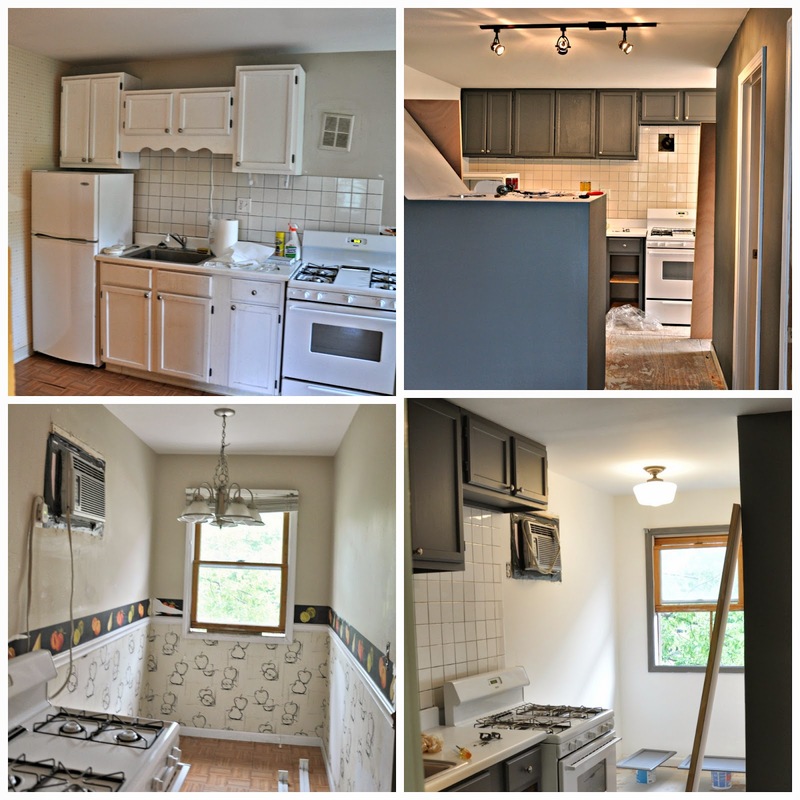 I'm happy to report that other than reinstalling the rest of the blinds and hanging the new track lighting, the main room of this efficiency apartment is ready for carpet and is FINISHED!